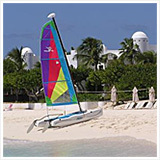 Anguilla is an easy island to get around. Driving is on the left side of the street and with a tiny amount of concentration, it's easy to fall in line if you are visiting from a country with right-side driving. The trickiest part of the left-hand driving may be the round-a-bouts, but know that there aren't many of them on the island. 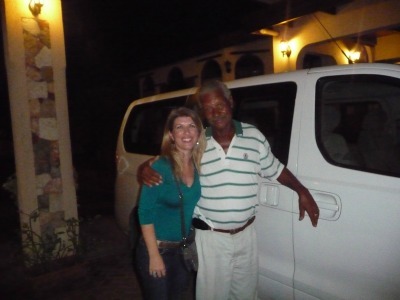 If you aren't in the self-imposed adventure mood and would prefer the company and the safety of being transported from place to place in Anguilla, you should are in luck because Anguilla's taxi drivers are the best of the best in my opinion. 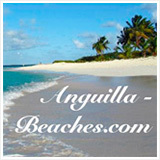 Anguilla taxis, for the most part, are able to provide everything from short distance transfer and do full island tours. Note: Many people in Anguilla pay attention to their plates - me included - and many memorize plates so it's easier to hail your friends as you pass them on the road. Many taxi drivers have fun and unique motto's too! Sam's motto is "No Journey too Short". Sam explained to me that he isn't troubled at all to take passengers short distances. After all, he is a taxi driver and he's happy to do his job. He's available from around 8:30am and until midnight and can hold up to 8 passengers in his bus. Note: The "bus" reference is similar to a large passenger van. 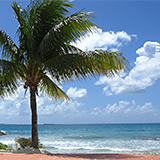 You'll find many people in the Caribbean refer to a van as something to haul cargo in, not people. A bus, also termed a mini bus, is like a large van with comfy passenger seats. Harold Vanterpool is "The Cabbie with the Golden Pipes". He has been driving a taxi since about 1985 and can carry up to 11 people. He is a singer/songwriter and will sing to you if you like! Harry Harrigan's slogan is "Drive To Arrive Alive With Harry!". He also drives a bus but noted that he can arrange for transportation from 1 to 200 people. 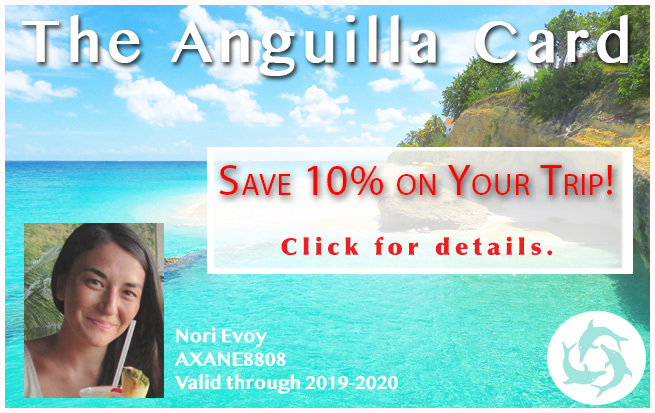 Glennis Connor is with Bennie's and is very often used by the discriminating and successful full-service destination management company Blue Sea Anguilla. 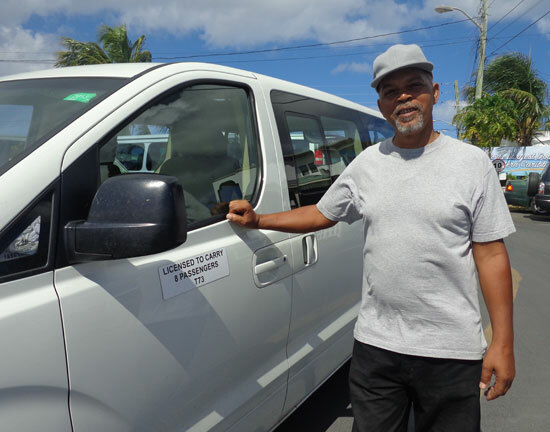 Glennis was explained how he'd just finished arranging for the large, visiting Mercedes-Benz incentive group to be transported multiple times, many days during their stay. 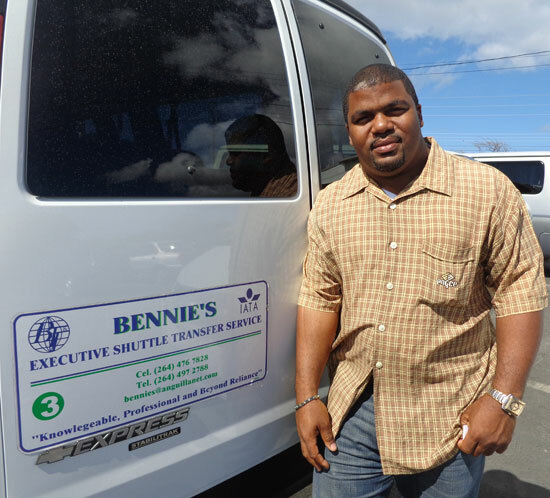 Bennie's is a "DMC", Destination Management Company serve as Ship Agents and who can handle large groups for weddings, island tours, packages, and more. 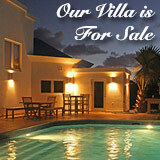 Glennis can be reached at 264-476-7828, 264-497-2788, bennies@anguillanet.com, or glennisconnor@hotmail.com. 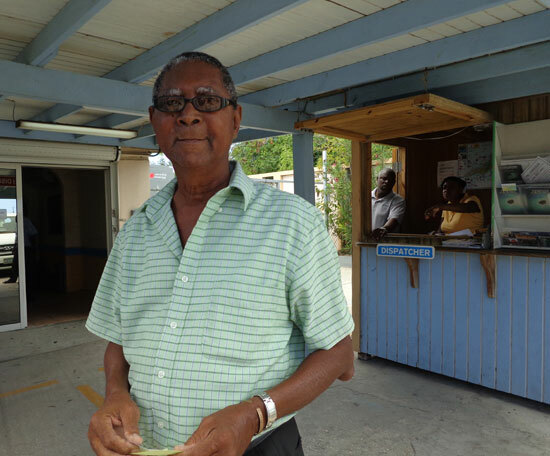 Sweet and friendly is Franklyn Richardson (known as Brod), who's been driving a taxi since 1965. 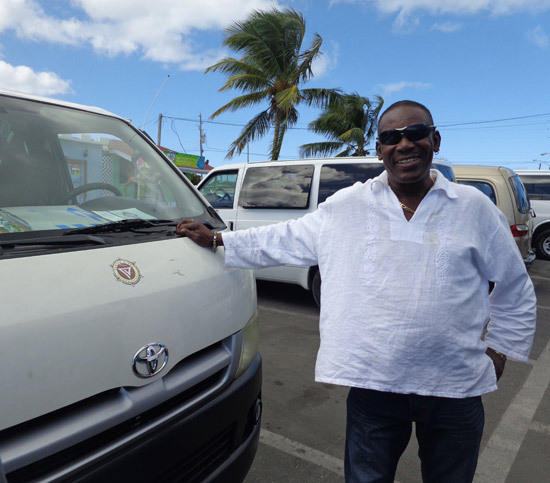 Brod started driving a taxi mostly solely for Anguillians, long before the tourism market existed in Anguilla. 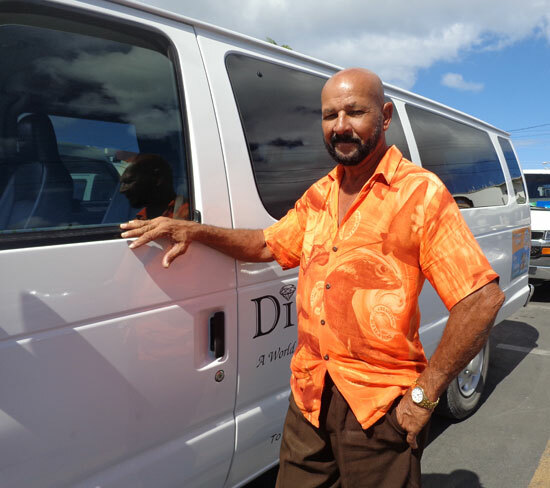 He can do tours for up to 7 people and is available for those who may like dinner transportation or need to get from point A to point B throughout the day. and on the other side of their friend in the blue hat is Mitchell Lloyd (on the left). Sitting alongside Brod, I found quite the gentleman and long-time taxi driver named Mitchell Lloyd. 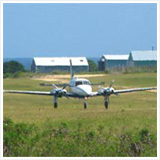 Mitchell can carry up to 12 passengers and accommodate many requests: beach trips, shopping trips, island tours, and more. Mitchell can be reached at 264-235-7240, 264-497-2250, or 264-497-8411. Next I met Benson Richardson who offers "Reliable And Efficient Service". 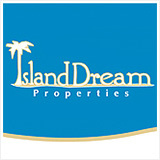 He's been in his profession since 1993 and can carry up to 12 people for a variety of needs, short distances, island tours, etc. Benson can be reached at 264-497-2829 or 264-235-2829. KeeKee's shining smile caught my eye next. 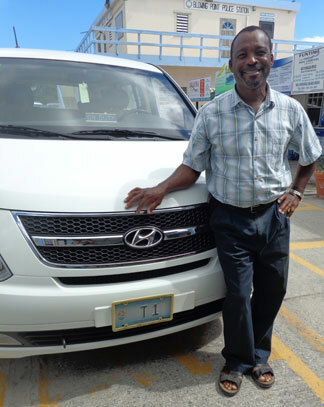 He proudly drives T1 and his motto is "Always Serving You With A Smile". 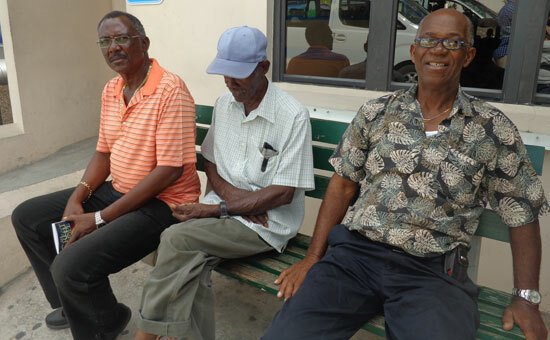 Not only can KeeKee take you wherever you need to go on Anguilla, you may be interested in seeing is wood carving work as you ride along. I saw a couple of pieces and thought it wonderful…a true artist and a locally made souvineer! KeeKee can be reached at 264-235-6126 or 264-497-6720. Howell Hughes' van can hold up to 14 people and will stay up late to get you where you need to be safely. 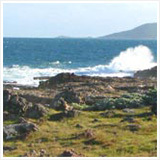 He will also do island tours. Howell can be reached at 264-235-6144. 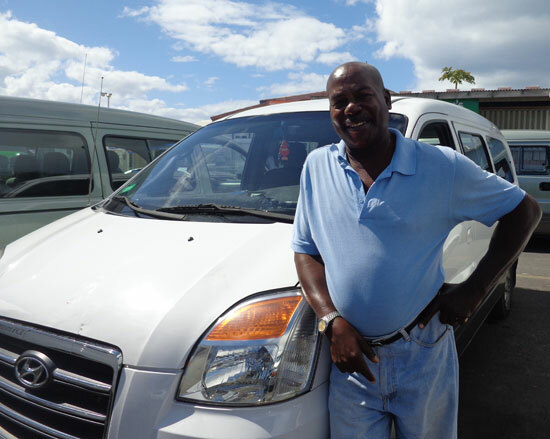 Last, but certainly not least, is Frank's Anguilla Taxi Service. 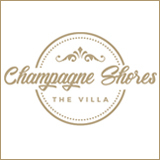 I've received glowing stories about Frank and his personal, flexible service. With a vehicle that carries 10 passengers, he's ideal for groups traveling together. He's patient and very accommodating. You can reach Frank at 264-497-4238 or 264-235-4238. 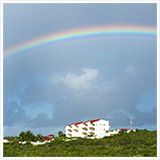 You can read more on Frank's Anguilla Taxi Service here. 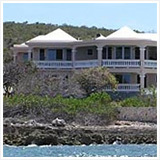 If you arrive to Anguilla at the Blowing Point ferry (where most enter Anguilla) and you require a taxi, there is a dispatcher on site just as you exit the ferry terminal, who will set you up with a taxi. If you wish to arrange for your own taxi, it's advised that you call or email prior to your arrival so that your preferred driver can be there waiting on you. Also, many Anguilla taxi drivers offer tours of the island, and can shuttle you between other points of interest on the island once you are here and settled in. 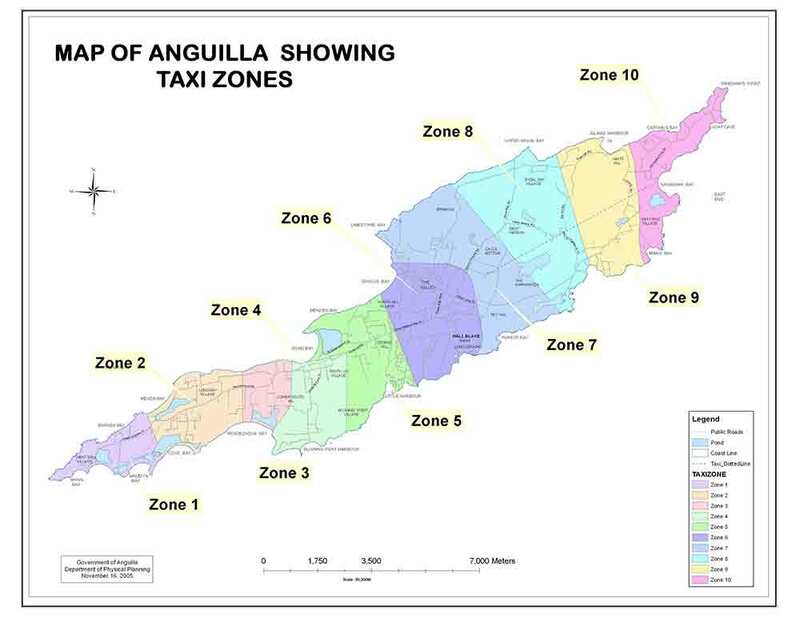 So, be sure to keep a hold of your Anguilla taxi driver's number! 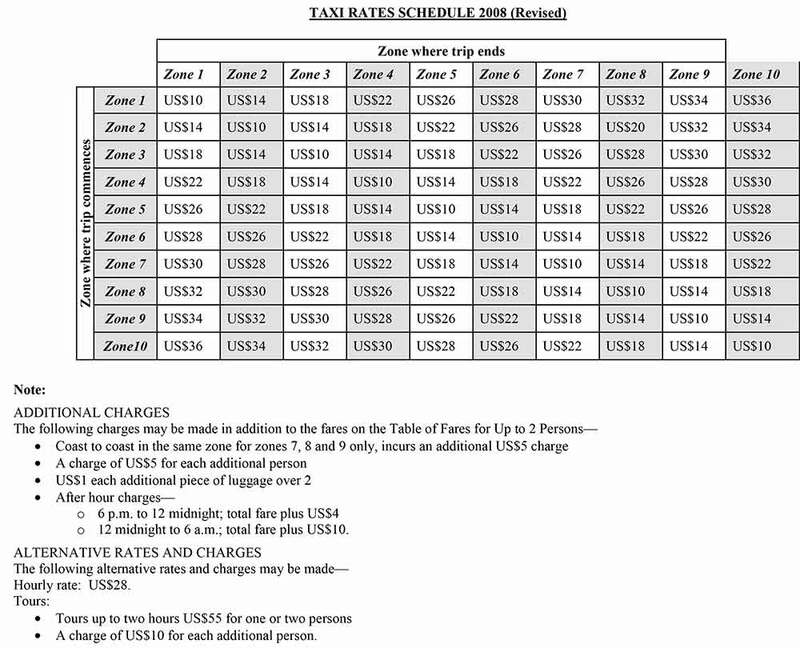 Taxi prices are set island-wide, here in Anguilla. Please refer to the "zone chart" and "zone map" below to get an idea of the price you can expect.